SuretyGroup.com writes bonds for California car wash businesses. In California, many car wash employees are immigrants who aren’t aware of the state’s labor laws. This can make them easy targets for employers who want to take advantage of their workers. Some employers participate in extreme wage theft and worker exploitation, such as shortening workers on their wages, overtime pay and tips, and denying rest and meal breaks. The workers are either unaware of their rights, have no resources for legal help, or fear repercussions if they complain. And since many car wash businesses operate on a cash basis, it’s easy to prevent a paper trail which could prove any wrongdoing. There have been lawsuits in recent years where car wash employees have spoken up about unfair labor practices … and won. California car washes awarded over $16 million in penalties and back wages from 2009 to 2014. In 2014, California’s Assembly Bill 1387 raised the surety bond amount for California car wash businesses from $15,000 to $150,000. This is to ensure the employers adhere to the industry standards and practices, which includes protecting workers from unfair labor practices. Employers are exempt from the bond requirement if they have a collective bargaining agreement in place that protects workers, such as a labor union. All California car wash businesses must register with the Labor Commissioner and pay registration fees. Nonpayment of fees will result in a fine. All fines and fees fund the Car Wash Worker Restitution Fund and the Car Wash Worker Fund. Post their registration form where it can be read by employees during the work day. Pay at least minimum wage – Covered non-exempt employees must receive at least the federal minimum wage, due on the regular payday of the pay period covered. Deductions for items such as uniforms are illegal if they reduce the employee’s wages below minimum wage or cut into overtime pay. Pay overtime – Covered non-exempt employees must receive overtime pay for all hours worked over 40 in a work week at a rate not less than time and a half of their regular pay. Allow rest and meal periods – Employees who work more than five hours a day must receive a meal period of at least 30 minutes, unless the day’s work period is no more than six hours. 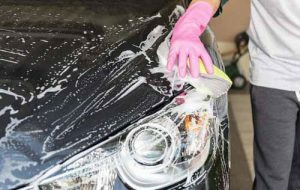 SuretyGroup.com helps California car wash owners stay compliant with the state’s laws. We offer free, no-obligation quotes, low rates, and fast service. Call our surety bond specialists at 844-432-6637 to get started. You can also email us at info@suretygroup.com, or apply online at SuretyGroup.com.